FFA - Dish Network was the only non-Islamic organization listed as a sponsor on the web site for a major convention of pro-Sharia, Muslim Brotherhood linked, Islamist groups. The Muslim American Society (MAS) and Islamic Circle of North America (ICNA) have a history of anti-Semitic rhetoric, support for Hamas and association with the Muslim Brotherhood. Their Islamist agenda advocates for Sharia law in America. Two Muslim Brotherhood organizations and powerhouse Islamist groups that seek to Islamize America held a conference that was expected to draw 9,500 Muslims to Chicago during the week of Christmas. The Muslim American Society (MAS) and the Islamic Circle of North America (ICNA) held their convention titled “Toward a Renaissance: believe, act & engage” December 21-25, 2012 at the Sheraton Downtown Chicago. “Renaissance” means Islamist dogma based upon the conference statement “The Arab Spring associated with the Islamic Awakening in many parts of the Muslim world.” Florida Family Association issued an email alert on December 3, 2012 that encouraged concerned citizens to send emails to officials at the Sheraton Downtown Chicago. Florida Family Association first reported Dish Network’s sponsorship of the convention in a December 10, 2012 email alert. A second email alert was sent out on December 12, 2012 which reported that it appeared that the convention web site had changed the logo in response to the email campaign. This was not the case. It is important to set the record straight. 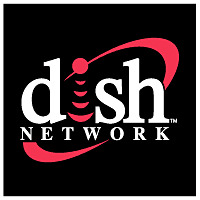 Dish Network was the only non-Islamic organization listed as a sponsor on the web site for this convention. The portion of the convention web site that lists the sponsors is shown below. The full convention site may be viewed by clicking here. The Muslim American Society (MAS) and Islamic Circle of North America (ICNA) have a history of anti-Semitic rhetoric, support for Hamas and association with the Muslim Brotherhood. Their Islamist agenda advocates for Sharia law in America. More information on these points is provided below. Why would Dish Network stand alone as the only non-Islamic sponsor for this convention being held by these two anti-Semitic, Hamas-linked, Muslim Brotherhood groups? Florida Family Association has prepared an email for you to send to Dish Network officials. MORE INFORMATION regarding the Muslim American Society (MAS) and the Islamic Circle of North America (ICNA). MAS is closely allied with the Islamic Circle of North America (ICNA), a Muslim community organization based in Jamaica, New York. While ICNA provides various educational programs and services to local Muslim communities, it has also promoted anti-Semitism and extremism. MAS holds its annual conventions together with ICNA, drawing thousands of participants each year. These conventions have featured known anti-Semites and provided a platform for extremist rhetoric. At their joint convention in Rosemont, Illinois, from December 23-27, 2010, several speakers made anti-Semitic and conspiratorial remarks, portraying Jews as a privileged group with undue power. During a panel about U.S. foreign policy in the Middle East sponsored by the anti-Israel group American Muslims for Palestine (AMP), Osama Abuirshaid, an AMP board member, said that the Jewish community is "revered in this country [the United States]" and spoke of "the Israel lobby" and its influence on the U.S. government. Abuirshaid asked, "How influential is this lobby in Washington? This establishment is as committed to Israel as it is to America." Othman Atta, a frequent speaker at AMP events, claimed "U.S. politicians don't have any concern for people in the Middle East, besides one group of people," referring to the Jews. Atta then went on to lambaste Judaism, saying, "Theft, detention, denial of rights…this is all done in the name of the Jewish religion." In front of an audience of hundreds, Atta delved into conspiracy theory, explaining that the perceived absence of WikiLeaks cables about Israel was a result of the documents being "censored by the media in the United States." Three members of the fringe movement Neturei Karta, who regularly appear at anti-Israel and anti-Semitic events, also attended the 2010 MAS-ICNA convention. One year earlier, at the MAS-ICNA joint convention in December 2009, religious scholars and political activists railed against Jews from both a political and theological standpoint. Rafiq Jaber, former President of the Islamic Association of Palestine, a Hamas-affiliated anti-Semitic propaganda organization, described Jews to the audience as "the worst kind of people," who came to Jerusalem "with false pretenses." Another speaker, Hamed Ghazali, Chairman of the MAS Council of Islamic Schools and professor at the Islamic American University in Michigan, told convention participants in Arabic that "Allah gave us the Jews" as the primary historical and religious example of those who "take the wrong path." Sheikh Raghib Al Serjani, an author and physician from Egypt, declared in Arabic, "It is the duty for all Muslims to liberate all of Palestine from the North to the South, from Al Quds to the sea, it's a duty for all Muslims to liberate one complete full land of Palestine… It's not just about liberating Al Quds. It's all occupied!" MAS and ICNA sought to draw participants to the December 2009 convention by advertising two known anti-Semitic extremists from abroad as keynote speakers: Zaghloul Al Najjar, an Egyptian cleric who has described Jews as "devils in human form," and Ra'ed Salah, leader of the Northern Branch of the Islamic Movement in Israel, who served jail time for financing Hamas. Although neither of the advertised speakers attended the convention, Salah was clearly praised by several individuals who did speak at the event. Omar Abu Irshaid, editor of Al Meezan online publication, and former editor of the anti-Semitic publication linked to the Islamic Association of Palestine (IAP), referred to Salah as "our great Muslim sheikh" and said, "Sheikh Raed is far more knowledgeable and far more experienced. I wish he was here to speak instead of me." Anti-Semitic messages are not new to these organizations. At an MAS-ICNA strategy meeting in Chicago in June 2001, Zulfiqar Ali Shah, ICNA's president at the time, stated: "If we are unable to stop the Jews now, their next stop is Yathrib [Saudi Arabia], where the Jews used to live until their expulsion by Prophet Muhammad. That's the pinnacle of their motives," according to Islam Online, a Web-based publication connected to Sheik Yusuf Qaradawi. MAS and ICNA have also worked with the North American branch of a radical anti-Semitic and anti-American Pakistani organization, Tanzeem-e-Islami, which operates in the U.S. under the name Islamic Organization of North America (IONA). MAS and ICNA leaders have attended IONA events. At IONA's official launching event in June 2004, Dr. Souheil Ghannouchi, MAS executive director and former president, said "I don't think there is any difference" between IONA and MAS ideology. IONA has also distributed anti-Semitic literature, including a book that blames the Jews for spreading usury in order to advance various conspiracies against humanity. The book, The Prohibition of Riba, reads: "Shylock, and the world of Shylocks, in real life today, are in control of the world economy and are constantly carving out their pound of flesh from the dying carcass of gentile humanity. The supreme Shylocks of today are the bankers, of whom Jewish bankers take pride of place, the International Monetary Fund and the world Bank, in which Jewish influence is significant, and the governments of the western world which today control the global economy, and in which Jews wield significant influence." One major speaker is Tariq Ramadan, who was banned from entering the U.S. in 2004 because of a donation he made to a Hamas front. The ban was lifted in 2010 on orders from Secretary of State Clinton. He is the grandson of Hassan al-Banna, the founder of the Muslim Brotherhood and the son of Said Ramadan, who was a major Brotherhood leader in Europe. Nihad Awad is the executive director of the Council on American-Islamic Relations (CAIR), an unindicted co-conspirator in the largest terrorism financing trial in U.S. history. The federal government says CAIR is a creation of the U.S. Muslim Brotherhood’s Palestine Committee. Awad publicly supported Hamas as far back as 1994 and referred to the terrorist group and Hezbollah as “liberation movements” in an Arabic interview with Al-Jazeera in 2004. Siraj Wahhaj is a favorite of the various Brotherhood affiliates and was listed as an “unindicted person who may be alleged as co-conspirators” in the 1993 World Trade Center bombing. He preaches that the U.S. should become an Islamic State. “If only Muslims were clever politically, they could take over the United States and replace its constitutional government with a caliphate. If we were united and strong, we’d elect our own emir and give allegiance to him. Take my word, if eight million Muslims unite in America, the country will come to us,” he said. Imam Zaid Shakir told the New York Times in 2006 that he hopes to see the U.S. nonviolently become an Islamic State one day. He approves of attacks on U.S. soldiers in America and says that Hezbollah’s bombing of the Marine barracks in Lebanon was not an act of terrorism. In April, he wrote a poem that put the U.S. and its military in a disgustingly negative light. He believes in 9/11 conspiracy theories and blasts the U.S. for “demonizing” Osama Bin Laden and the Taliban, while characterizing Al-Qaeda, Hamas and other Islamist terrorists as flawed freedom fighters. Click here to read more at Frontpagemag.com. Islamic Circle of North America is (ICNA) is a leading defender of Sharia law in America. ICNA’s web site Defendingreligiousfreedom.com wages battle on efforts to prevent Sharia law from encroaching in American courts. The Islamic Circle of North America waged a billboard campaign in Kansas aimed at opposing legislation that would prohibit Kansas courts from considering Sharia law. Thankfully the Kansas Legislature approved the bill which was signed into law by Governor Sam Brownback. 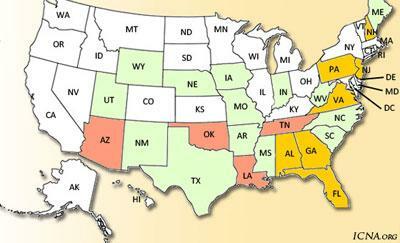 The Islamic Circle of North America web site has not updated their map below to report that Kansas passed the legislation. • Failed in 14 states: Arkansas, Indiana, Iowa, Maine, Mississippi, Missouri, Nebraska, New Mexico, North Carolina, Texas, South Carolina, Utah, West Virginia and Wyoming. • Passed in 4 states: Arizona, Louisiana, Oklahoma and Tennessee. • Stalled in 5 states: Alabama, Florida, Georgia, New Hampshire, New Jersey.